This was a gimme from a friend whos now passed on. Some things I'd like to change would be the rings, but I'll leave it as he left it to me. Thats a good looking stick.Look well taken care of compaired to some i have seen come thru the shop. Thanks Bigdaddy, I do take exceptional care of my equipment, I try to anyway. I never let any part of the gun go unattended to, they're just too expensive to replace. I'll post pics of my other rigs as well. I hope everyone else will do the same. Bottom: My Savage .17HMR Accu-Trigger with Redfield 3-12X40AO from SWFA! 1930's Greifelt Zi-Di cal. 5.6x35R Vierling with Oigee (Berlin) 21/2 X scope on see-through claw mounts. Mark X barreled action with prewar german stock and trigger set, 30-06 cal, Nickel Gerhardt 4x36 scope on EAW detachable mounts, Williams Guide open sights. 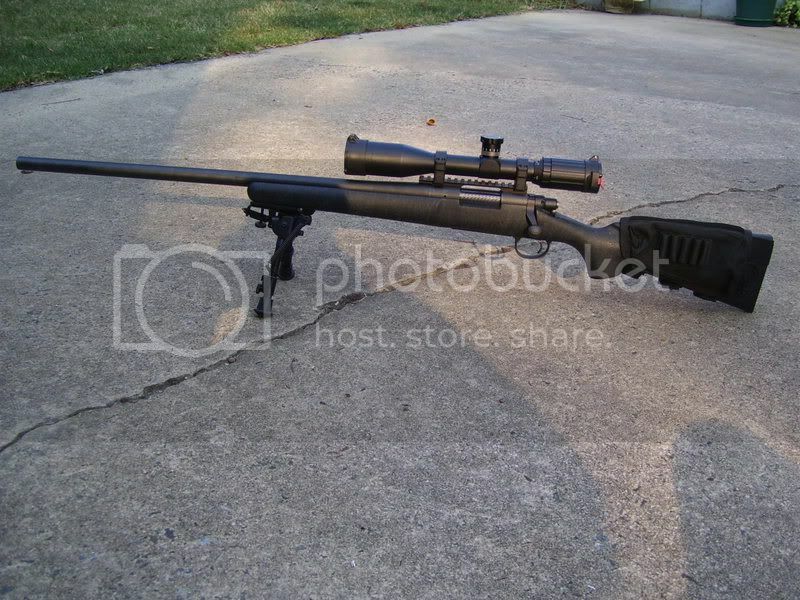 Remington 700 VSLH .308, 10x Super Sniper, Badger 20 MOA rail, Badger rings, Eagle Stock Pack, Harris Bipod "S" model. She do it real nice!! Welcome to The OT, No Quarter!! DAYYUM!! You ride a Ford and shoot a Remington??? I got my Savage back after some accurizing and a new barrel, I'll post some pics soon. Rechambered for 300 wsm. should be sweet. Finally finished putting together a custom .243 Winchester, based on a Mauser action made by Parker Hale. After at least 100 hours of work, it is gorgeous. I just have not found the time to take some pictures, but will do in the next day or two and post them. Just for all those Leupold lovers, its wearing a VX-II 3x9 40mm. Custom Mauser 1909 in 338 Win Mag cal. with Leupold M8 6x42 on Leupold Quick Release mounts. That is really a nice looking rifle. How does it shoot? Judging by the Zebra...... I'd say pretty good! It shoots 2 inches groups at 165 yds. (150 mts), so it is good enough for it's inteded use, big game. Up to now it has 1 boar, 1 red stag, 1 zebra, 2 warthogs, 2 impalas, 1 big kudu, 1 orix. I got it ready to be presented to all you fine folks. The stock is OE but has been extensively worked I like the light weight of the OE stock. Bet she's a shooter too!! I haven't shot her yet, WORK BITES, But I'm looking forward to it, Longer Barrel and ported It should shoot sweet. A savage shooter here...........heres my varmint getter.......savage 12bvss with a 4x16x40 4200 elite in signiture rings. Shoots better than me.......when I do my part and winds down it will shoot low twos at 100yds. Some more of my babies, I wish I still had my others, It'll take me a while to replace them.